QLD Forum "Agriculture, Food and Nutrition Security - Involving the Next Generation"
We are very pleased to have The Hon Mark Furner MP, Minister for Agricultural Industry Development and Fisheries, to open our forum. 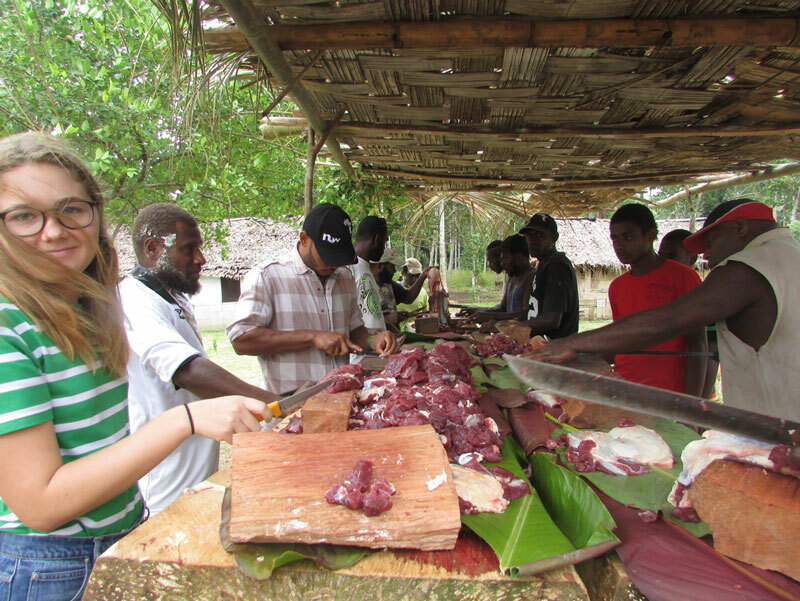 Fynn de Daunton will be presenting on her research in the Pacific – here she is in Ladi village, preparing meat for a wedding ceremony. We continue to encourage the next generation of agricultural scientists to work on issues around food and nutrition security. Come and hear first hand from some of the passionate young researchers we have recently supported to include an international component to their livestock, fisheries and crop studies – its impact in-country and to Queensland agriculture and how they have benefited professionally and personally – highlighting the real win-win-win that results. If you are a young researcher with an interest in agriculture, animal production, fisheries, forestry, natural resource management or food security or perhaps the many cross-cutting issues involved such as environment, climate change and gender studies, come along and find out how you can become engaged in international agricultural research and development. Or if you are a more experienced researcher, come and engage with the ‘nextgen’. You can also hear from Dr Dan Walker, Chief Scientist and Dr Peter Horne, General Manager, Country Programs, both from the Australian Centre for International Agricultural Research (ACIAR) explaining progress in food and nutrition security and the importance of Queensland’s expertise to Australia’s international development efforts. The program will also include The Hon Mark Furner MP, Minister for Agricultural Industry Development and Fisheries, the Fund’s Queensland Committee Chair, Professor Kaye Basford, and our Chief Executive Officer, Dr Colin Chartres who will explain how you can partner with the Crawford Fund and the importance of capacity building at home and in developing countries. A series of Q&A sessions will enable lots of interaction between speakers and the audience. Following the forum, there will be a free networking reception from 5pm-6.30pm. For further details contact Cathy Reade, and to view the program click here. Please note that as the event is in the Parliament House Precinct, all guests are required to register and provide Photo ID as part of the security process on admission to the building.